Habit: Bacopa monnieri grows as a creeping prostrate herb creating large dense mats. The stems and leaves are semi succulent. The leaves are arranged oppositely, sessile on the stem and up to 2.5 cm in length. The leaf shape is spatulate to obovate with a rounded leaf apex and an entire leaf margin. The zygomorphic flowers are solitary in leaf axils and have two subtending bracts. There are 5 unfused, green sepals in the calyx. There are 5 fused whitish blue petals in the corolla. There are 4 stamens fused to the corolla tube at its mouth. The ovary is superior with two locules and numerous seeds. The fruit is a capsule. Habitat: Bacopa monnieri grows along the edges of continual and ephemeral fresh water wetlands and in Sabal palmetto woodlands. Distribution in Bahamas/Globally: Bacopa monnieri occurs in the central and northern islands of the Bahamian Archipelago as well as in the southern United States, the Caribbean region and in the new and old world tropical latitudes. 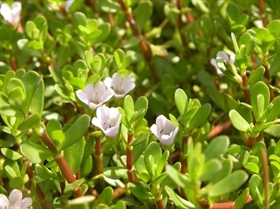 Medicinal/Cultural/Economic usage: Bacopa monnieri has no know medicinal uses in the Bahamas. Bacopa monnieri is well known as an Ayurvedic herb to enhance memory and cognitive ability. Extracts are sold over the counter. It is reported to have anti-oxidant and anti seizure properties as well. Dosage concentration can be toxic and lethal. There are many active compounds within this species. Extracts should NOT be made or used without proper training and background!!!! !